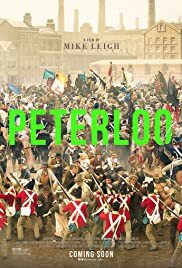 Director: Mike LeighWriters: Mike LeighStars: Rory Kinnear, Maxine Peake, Neil BellSummary: An epic portrayal of the events surrounding the infamous 1819 Peterloo Massacre, where a peaceful pro-democracy rally at St Peter's Field in Manchester turned into one of the bloodiest and most notorious episodes in British history. The massacre saw British government forces charge into a crowd of over 60,000 that had gathered to demand political reform and protest against rising levels of poverty. Many protesters were killed and hundreds more injured, sparking a nationwide outcry but also further government suppression. The Peterloo Massacre was a defining moment in British democracy which also played a significant role in the founding of The Guardian newspaper.